As high performance technical garments, firefighter protective clothing is required to deliver levels of protection and wearer safety which not only need to satisfy national and international performance standards but also trust in its integrity by those whose health, safety, and ultimately whose lives, depend on it. Much has changed in the way today’s firefighter PPE is designed and made as compared with as little as 15 years ago, and it is these product and performance developments which need to be understood by users when specifying garments for firefighters to ensure that the benefits, which the latest technology in fabrics and manufacturing methods are able to provide, are fully realised in the procurement process. 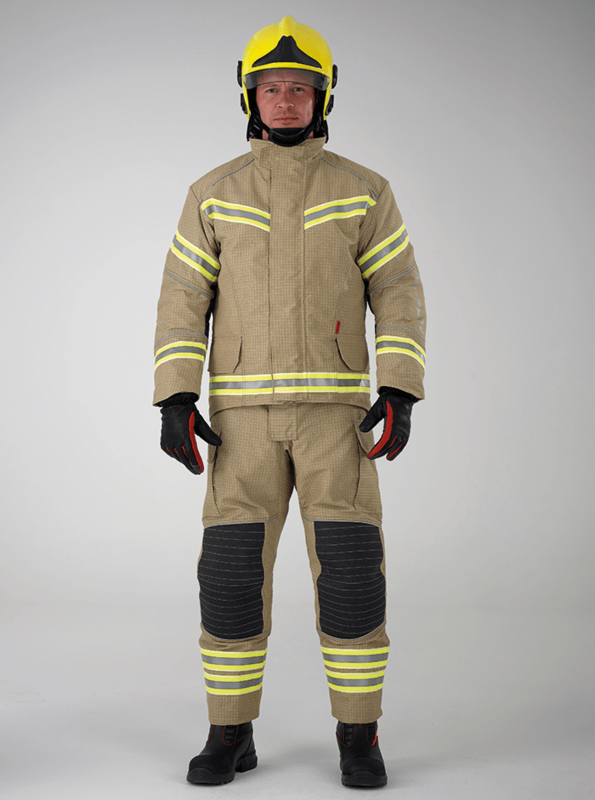 As high performance technical garments, firefighter protective clothing is required to deliver levels of protection and wearer safety which not only need to satisfy national and international performance standards but also trust in its integrity by those whose health, safety, and ultimately whose lives, depend on it. There are a number of elements which contribute to the overall capability of a supplier to deliver to the world class standards widely accepted as essential to ensuring safe working for firefighters whether involved in structural, wildland or technical rescue operations. The purpose of this article is to look at each of these to demonstrate their respective contributions to overall service delivery. As a manufacturer, the process begins with having a team of skilled professionals with a combination of technical and design expertise and experience. Within this skill set will be an in-depth understanding of materials, their characteristics and behaviour during both the manufacturing process itself as well as the testing procedures carried out on completed garments where two, or more, layers are involved in the construction. It is the skill of the designer to be able to translate a customer’s requirements into a product specification which meets both these as well as the performance required by national or international standards. Given the primary purpose of firefighter garments to protect the wearer from external risks associated with exposure to heat, flame lick, flashovers, water ingress and, where appropriate, blood borne pathogens, it is essential to design garments in a way which will minimise skin and body exposure through the optimal reduction in transmission through the garment. Coupled with this is the need to alleviate the known health risks from the physiological responses of the human body to being enclosed within the garment and its ability to allow heat and moisture vapour to escape to minimise operational heat stress and discomfort from sweating. Designing garments to address the complex combination of risks emanating from outside and inside the garment is key to creating high performance PPE. Bristol LayerFlex™ in 3DP outercoat with high vis yellow RescueFlex™ undergarment. Firefighter garments are bespoke items of clothing with every coat and trouser being made to measure. Optimal protective performance can only be assured through using a comprehensive sizing procedure which ensures the individual wearer has well-fitting garments. In addition, the operational requirements of individual fire and rescue services will be reflected in the detailed specifications drawn up by their procurement team. The wide variety of options available to meet these particular preferences include alternative types of trouser front and leg openings and knee pads as well as cuff styles on fire coats. Other options include detachable linings and knee and elbow reinforcements. Operational safety features such as integrated safety harnesses and drag rescue devices are sometimes specified. Breathable reflective tape is used to improve the overall moisture transmission out of the garment whilst Trimsaver is a thread encapsulating technique used to protect the thread from abrasion and reduce garment wear and repair. Firefighter accessories including tools, lighting and communications equipment all have to be carried safely requiring the provision of a wide range of loops, straps, D-rings, glove hooks as well as pockets and flaps which add further to the large number of permutations which form part of the bespoke nature of PPE design. A further consideration is the need for fire services to present a professional and clearly recognisable identity to their communities. Colours and badging feature increasingly in procurement specifications. This has led to the introduction of a range of new fabric colours and the increased use of Velcro fixings for identification badges with logos, names and roles being individually catered for and easily replaced when an individual’s PPE needs to have a name, rank or job title changed. Whilst blue and gold have been the traditional dominant colours for PPE, reds, yellows and greens are becoming more popular and frequently used in combination for emergency services protective garments. The characteristics of the natural and synthetic fibres used in the manufacture of specialist PPE fabrics all play a key role in determining the finished garment’s protective features. World class performing outer fabrics display different characteristics when exposed to heat and flame and will be selected during the procurement process depending on a user’s preferences. DuPont Nomex® and PBI Performance Products offer fabric weavers fibre alternatives which become part of the range of outer layers available as Nomex®, PBI and TITAN, Hainsworth Technology fabrics whilst other fibre producers and weavers offer a further range of options. W L Gore are the principal suppliers of the most commonly specified moisture barriers which come in a variety of fabrics in their GORE-TEX® and CROSSTECH® ranges. Thermal barriers used as the inner lining of structural fire kit are either Nomex® barriers or ECO-DRY, Hainsworth Technology linings. Firefighter PPE is offered in a wide range of styles. Each manufacturer designs garments in a range of models which they consider most appropriate for their served markets. Available options should recognise the need to offer specifications to meet the budgets available to fire and rescue services in different countries. In some parts of the world, single performance standards prevail whilst in others, for example in Europe, structural firefighter kit can be offered at two levels – EN469:2005 Level 1 and 2. 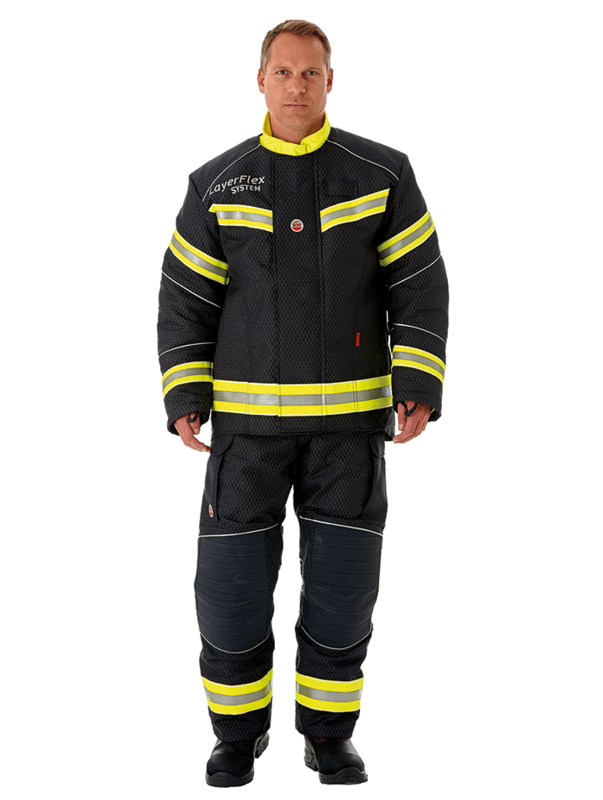 Additionally, the broadening scope of firefighter activities, including technical rescue and wildland firefighting, has seen the introduction of more specialised garments specifically designed for different operational environments. Given the current level of choice in firefighter garments meeting the relevant standards requirements, the procurement process should seek to exploit the innovative capabilities of alternative suppliers. In so doing, manufacturers will be encouraged to focus attention on new product development leading to a wider choice of cutting edge garments to the customer’s benefit. Bristol XFlex™ in PBI Matrix. Personal protection in hazardous occupations, amongst which the emergency services rank as having exposure to some of the greatest risks outside of the military, clearly demands that garments are rigorously tested by independent test facilities. This will ensure that they fully meet the performance standards firefighters expect, and rely upon, to protect their health and safety whatever front line conditions they encounter. Special test rigs have been designed to carefully measure the performance of garments. These include strength and permeability tests for fabrics and composite constructions such as those provided by the British Technology Testing Group (BTTG) in the UK. Fire tests are carried out using special manikins which simulate a variety of fire ground scenarios and measure heat and flame penetration. The DuPont™ Thermo-Man® fire test rig in Switzerland is one example whilst BTTG use two heat sensing manikins, RALPH and SOPHIE, male and female garment rigs which comply with the manikin test standard ISO 13506. Reference was made earlier to the importance of standards in connection with the various types of garments manufactured to protect firefighters across all areas of activity. The standards which cover the main regions of the world are European (EN) and North American (NFPA). In the Middle East and Gulf region, with close connections with both North America and Europe, it is common to find both EN and NFPA fire standards in widespread use. Standards are developed by working groups comprised of experienced and technically qualified representatives drawn from all parts of the industry including fibre manufacturers, fabric weavers, PPE manufacturers, independent test houses and fire and rescue services. Bristol, through contributing the expertise of its technical teams, has been involved in this work from the time of the original UK standards in the 1980s and in European standards since the inception of EN standards in 1995. Bristol, as a global supplier, has developed a range of styles to suit operational environments ranging from cool temperate to tropical regions of the world. In regions such as the Arabian Gulf and the wider Middle East, arid, sub-tropical climates present particular challenges in relation to the potential risks of heat stress in operational conditions which will commonly be in the range 30-45˚C in summer months. Utilising the scope provided by the range of alternative fabrics now available on world markets for the manufacture of firefighter protective garments, new concepts, such as Bristol’s XFlex™, have emerged in recent years to meet these needs more directly. Clearly, given the 3-layer construction of structural garments, the issue of minimising wearer heat stress is more critical in warm temperate, sub-tropical and arid climates as well as tropical and equatorial climates. Bristol’s LayerFlex™ is one solution. Using a layered approach, the lower levels of protection needed for technical rescue and wildland firefighting are provided for through the use of an under coat which is boosted to structural EN469:2005 Level 2 by the addition of an over garment. In this way, and by incorporating the latest lightweight fabrics, body heat build-up can be minimised. It is clear that, in order to optimise the improved comfort and performance offered by the latest designs in firefighter PPE, suppliers and procurement teams should work increasingly closely to ensure that specifications, particularly in tender documents, provide scope for suppliers to discuss the various options available. Innovation brings with it opportunities to improve overall performance and deliver cost savings. Extending the service life of PPE through the use of managed services can bring further economies at a time when public sector budgets in many countries around the world are under close scrutiny.